Sitemap - Website of TrimAndJulka! 10/04/2017 - Magic & Alpha's Anthology is Finally Here!! 10/03/2017 - Be sure to take part in the Halloween Scavenger Hunt! 09/21/2017 - Ice Warrior Is Up For Preorder!!! 11/01/2016 - $2,000 in Prizes! 08/12/2016 - Friday Fun Quote Brought to You by Monsteritas and kisses that leave you breathless!! 05/10/2016 - DEVIANT WARRIOR HAS WON!!!! 04/29/2016 - Friday Fun Quote Brought to You by Monsteritas and Hellbound and our angel Illianna! 04/08/2016 - Friday Fun Quote Brought to You by Monsteritas and BIG DREAMS! 01/15/2016 - Another great review for Dream Warrior! 11/09/2015 - Another great review for Dream Warrior! 09/25/2015 - Dream Warrior - Amazon Bestseller!! 07/30/2015 - Review for Pema's Storm!!! 05/29/2015 - Friday Fun Quote Brought to You by Monsteritas and clear blue skies in Texas! 05/27/2015 - Another outstanding review for Dream Warrior and Mystik Warrior!! 04/24/2015 - Review for Mystik Warrior!!! 04/17/2015 - Friday Fun Quote Brought to You by Monsteritas and Pema's Release!!! 04/17/2015 - Pema is here! 04/17/2015 - Celebrating release of Pema's Storm! 02/27/2015 - Friday Fun Quote Brought to You by Monsteritas, chips and jalapeño ranch dip!!!! 02/23/2015 - Need a good book? 02/06/2015 - Mystik Warrior cover!! 01/21/2015 - Dream Warrior release!!! 01/15/2015 - Dream Warrior Book Cover!! 11/28/2014 - Friday Fun Quote Brought to You by Monsteritas and the Riverwalk Christmas Parade! Have a great weekend. 07/25/2014 - Faces of success! 06/11/2014 - Hump Day Hotties: our favorite one is the one with the blue eyes!! 05/28/2014 - Hump Day Hotties! 05/26/2014 - Happy Memorial Day!! 05/21/2014 - Hump Day Hotties!! 05/14/2014 - Hump Day Hotties!! 05/07/2014 - Hump Day Hotties!! 05/05/2014 - Happy Cinco De Mayo!! 04/16/2014 - Happy Hump Day! 04/02/2014 - Happy Hump Day! 03/20/2014 - Spring is here, happy days!! 02/26/2014 - Happy Hump Day! 02/14/2014 - Happy Valentine's Day! 01/24/2014 - Today is a victory! Kay Child, Brenda's mom, had her last chemo treatment. They rang the bell and we heard her roar all the way to Texas! You go, champ!!! 01/22/2014 - We are in total agreement with this! 09/26/2013 - Time to celebrate Tami's 2 year survivor mark! 06/21/2013 - Transformers 4 and Mark Wahlberg! 06/04/2013 - Summer is Offically here! 05/03/2013 - Friday Fun Quote Brought to You by Monsterita! 05/02/2013 - Happy Hump Day!! 03/31/2013 - Happy Easter from two great chicks!! 03/25/2013 - The boil was a blast!! 03/22/2013 - Hot Enough to Melt Ice! 03/16/2013 - Ritas and Fajitas, Pitchin' and Bitchin'! Great way to spend a Saturday! 03/15/2013 - Fun Friday Quote Brought to You by Monsterita!! 03/04/2013 - Birthdayrita, yeah baby!! 03/04/2013 - Happy 40th Brenda!! 02/22/2013 - National Margarita Day!! 02/14/2013 - Happy Valentine's Day!! 02/12/2013 - Happy Fat Tuesday!! 01/08/2013 - The first 2 chapters are here! 01/08/2013 - Looking for a literary agent to represent Dream Warrior. 01/01/2013 - We have finished our first book. We've got a winter treat for you. 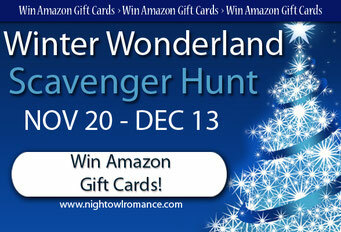 We're one of the sponsors of the Night Owl Reviews Winter Wonderland Scavenger Hunt. During this event We're going to help you find some great new books. Make sure to check my featured title out along the way. The grand prize is a $100 Amazon Gift Card. I've got a Hallowpalooza treat for you. I'm one of the sponsors of the Night Owl Reviews Hallowpalooza Scavenger Hunt. During this event I'm going to help you find some great new books. Make sure to check my featured title out along the way. Magic & Alpha's Anthology is Finally Here!! In more fantastic news, Captvity, book 1 in our new Hollow Rock Shifters series is out today! 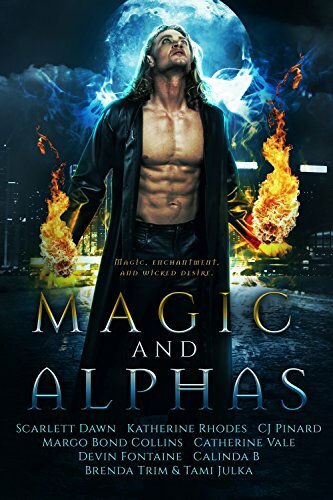 It is being released exclusively in the Magic and Alphas anthology with eight new, full-length novels by best-selling authoirs like Scarlett Dawn.